Cassandra Clare is one of the rare talents on the YA paranormal romance shelves (and there are many, many books on those shelves right now) who creates not just a good romance, but a good story. City of Fallen Angels is the fourth book in the Mortal Instruments series, and it is like all the others, consistently raising the stakes without losing the emotional core of who these characters are. 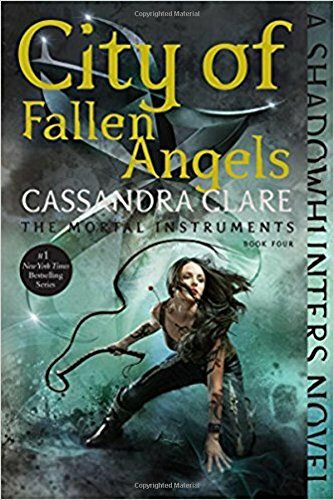 The start of the second half of this series, City of Fallen Angels is no longer just the story of Clary, who discovered that her mother was born to a secret society of demon hunters—therefore making her one as well. It’s now a much bigger story, and this book brings in many of the threads introduced in previous volumes, knitting them together cleanly and with such flair that they feel like a reward for loyal readers. The books have been consistently opening up the series, and this one goes another step in that direction. City of Fallen Angels is the story of Simon and what it means to be not quite vampire but definitely not human—as well as cursed with the oldest curse in the book. It’s about Maia, turned into a werewolf by the only guy she loved and then left to fend for herself. Then there’s Alec, trying to figure out how to function in his first real relationship, which happens to be with a warlock several hundred years older than he. Isabelle is a character who can’t trust anyone. And the book also explores the Clave and how they rebuild after the near-devastating war that closed Book Three, City of Glass. Finally, it’s the story of Clary and Jace, as it has been from the beginning, learning to be together with a love that appears about to destroy them both. It’s hard to increase the stakes when you had a world-altering war with a nearly indestructible villain for the climax of your previous book, but Ms. Clare manages to do just that, and in the best way possible: The next phase of the story grows directly out of the consequences of every character’s actions in the previous three books. As usual, the consequences are worse than the events that led to them—and the drama amps up almost immediately. There’s a slight problem in the genre right now in which teen love is seen as the be all and end all of a 16-year-old’s life: The only and best thing she will ever accomplish. When the girl in question is hollow and useless like some are, this becomes a message about how young girls need a strong, controlling man to complete them. City of Fallen Angels avoids that pitfall almost entirely. Clary is strong, knows herself, and is learning to control her own unique abilities. She loves Jace desperately, as only a 16-year-old really can, but there’s a hint in this book that there’s more going on in their connection than just first love, and it’s a fact of the story that the very love they’re pursuing is one of the causes of the destruction that comes next. Add to all this the literal sins of the fathers, ancient evil that’s been gifted a loophole, more than a few self-destructive tendencies, a weakened and shattered status quo facing challenge, and a whole lot of real, honest grief, and you have a tight, tense, involving read. Plus, there’s a little nod to readers of her second series, the Infernal Devices, which launched last year with Clockwork Angel and continues later this year with Clockwork Prince when a character from that book shows up here. This cross-pollination is like a gift for dedicated readers, and the author’s awareness that there are dedicated readers is charming. It makes the fans feel like the author cares deeply about them. City of Fallen Angels is an immensely absorbing and affecting novel aimed at a young adults mostly by marketing; the book is about teens, but they have the emotional depth and breadth that a reader wants from adult books, and so the book is a true crossover. If you haven’t read the rest of the series, you could likely start here: Everything that happened previously is referenced clearly enough that context is provided without drowning the reader in info-dumping exposition, and the events of this book are new enough to allow new readers to jump in and feel instantly captivated—then go back and read the first three. They’re more than worth it. City of Fallen Angels is easily one of the best YA series out there right now. And since there is has a finite number of books in the series, best enjoy them all.